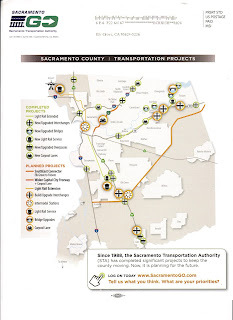 As part of its effort to market a possible countywide sales tax increase, the Sacramento Transportation Authority (STA) has started sending mailers to registered voters in Elk Grove. The STA Board of Directors, which includes Elk Grove Mayor Gary Davis and Councilman Pat Hume, have not yet decided whether it will place the so-called Measure B sales tax increase on the November ballot. That measure, which requires a two-thirds super-majority for passage, would increase sales taxes in Sacramento County by one-half cent. As part of a strategy to gauge voter interest and gin up electoral support, several months age with the help of outside consultants, a plan was developed to sell the benefits from the previously approved Measure A sales tax increase and tout what another sales tax increase could bring to Sacramento County communities. On the mailer received this weekend, there appears to be a two-prong approach. On the first front, the mailer discusses an issue that is becoming increasingly important in Elk Grove - fixing crumbling roads. The marketing piece promises "The plan's top priority is fixing local neighborhood streets first, saving money in the long run." To that end, if approved, the campaign literature promises on a countywide basis it will repave neighborhood streets, fix potholes rehabilitate aging bridges and improve safety for bicyclist and pedestrians. 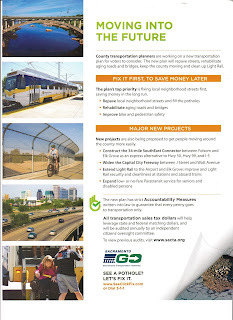 On the other front, the mailer promises to deliver a host of county-wide projects. 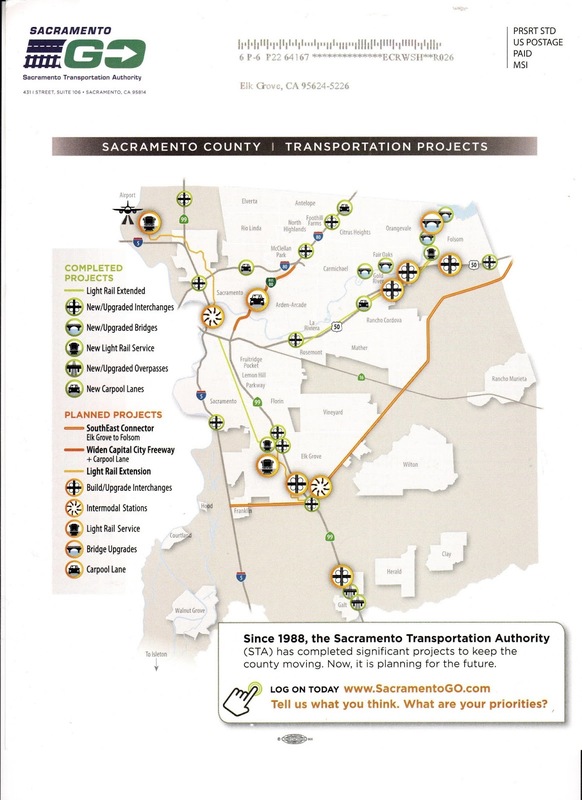 Those projects include the 34-mile Southeast Connector, which has unanimous support from the Elk Grove City Council and home builders, widening of the Capital City Freeway between J Street and Watt Avenue, extend light rail to Sacramento International Airport and Elk Grove, improve safety and cleanliness of Sacramento Regional Transit's light rail service, and expand para-transit and senior citizen services. 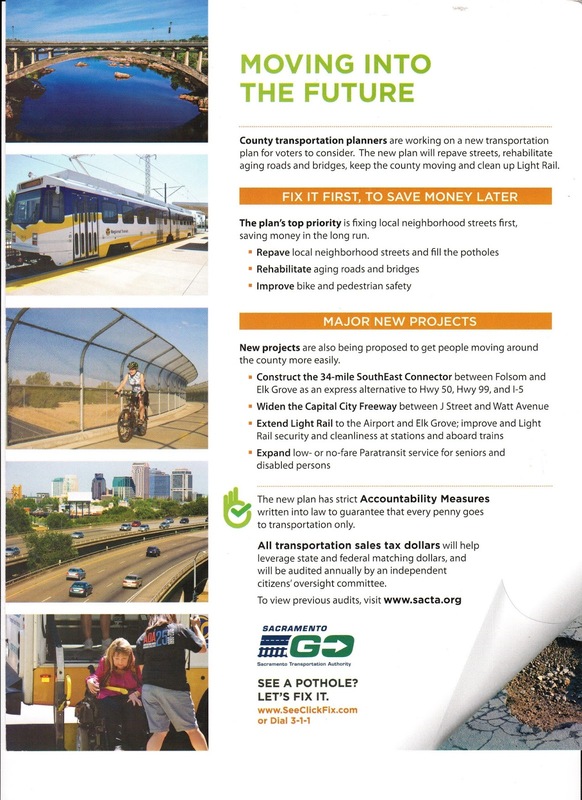 The campaign literature, however, does not provide a timetable for how long the sales tax increase will last, when maintenance and repair programs will be initiated, or completion of major projects like the Southeast Connector. Against the advice given in 2014 by its former Director of Public Works, the Elk Grove City Council has decided not to fund road maintenance expenditures estimated at $8 million annually in hope that these monies might become available after 2016. If the so-called Measure B is not placed on the ballot, or if it is on the ballot and fails to win approval, the Elk Grove City Council has not revealed how it will pay to repair crumbling roads in the city. The STA board of directors is expected to decide whether it will pursue the sales tax increase by this July. The Southeast Connector is not a viable alternative to 99/50 or connection between 99 & I-5. With 30 some stop lights it will drive the average speeds way down. The current stop light at East Stockton and Grantline is a prime example of it being inefficient. Then open the mall and expand the city limits south and it's not an alternative to get to I-5 either. What it does is open areas for further development along Jackson Hwy and South of EG. What is interesting to me is that the voters will be asked to approve several tax increases and/or bond measures: Elk Grove USD, possibly STA, possibly the city of Elk Grove. These agencies all run the risk of voters getting mad and saying, “None of the above!” I can hear people saying NO to the public being a continual money faucet whenever government needs more money. In my opinion, we need the money for the roads and it is clear some of our local schools are very much need of repair. The school my sister works at is in dire need, especially the roof. Buckets everywhere! But I ask: What has gone array with long-range budgeting for capital repairs? Surely these elected officials should know repairs are part of the cost of running a city and/or a school district. I trust our leaders when they say they need more money to fix our highways. I know they try real hard to spend our money like it is their own, and all have high qualifications as leaders and business professionals. They all could be working for Fortune 500 companies and we are lucky to have them! It is interesting to compare this idea with the EGUSD planning. The EGUSD has defined the work needed at each school so that we know where the money will go. So far, the Measure B looks like "Give us the money and trust us to use it wisely". I would want to see much more of a definition for the use of these funds before even considering it. While $8 million sounds like a lot of money, the road repairs we need are a drop in the bucket compared with the rest of the County.